When humans discovered pecans are great to eat has been lost in the mists of history. However, we do know that Native Americans were the first to know the food value of this Native American nut. Later, European colonists also found pecans to their liking. In fact, none other than Thomas Jefferson espoused the merits of this tasty nut. George Washington wrote that Jefferson presented him with a number of pecan trees, which he planted at Mount Vernon, Washington’s historic home. Over the years, no native North American nut tree has been selectively bred more often than the pecan. As a result, today there are more than 1,000 varieties. Some are grown in Georgia, bearing names such as Stuart, Schley, Money Maker, Pawnee Creek and Desirable. Of course, we Georgians still love pecans. We eat the delicious nutmeats as snacks, and use them in scores of mouth-watering dishes like cakes, cookies, casseroles, pies, salads, candies and stuffing. In fact, I cannot think of a dish containing pecans that I do not like. That being said, it is a little-known fact that backyard birds love 'em, too. As such, I believe they deserve a place alongside the mixed seeds, sunflower seeds, suet and other delicacies we traditionally offer regular customers at our backyard bird diners. Because pecan meats are loaded with fat, protein and minerals, they are a great source food for birds. This is especially true during the throes of winter when food is often scarce and birds struggle to simply survive the bone-chilling weather. Over the years, bird enthusiasts have fed wild birds a number of nuts without knowing which are preferred. Decades ago, however, a study done in Georgia was designed to determine the nuts birds favor at feeders. After the data were analyzed, it was found that black walnuts were preferred over all of the other nuts tested. 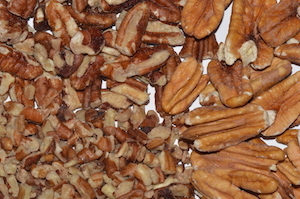 However, pecans were the second-most favored nut tested. Despite the fact that many birds relish these readily available nuts, inexplicably, pecans are rarely fed to wild birds or even mentioned in books dedicated to bird feeding. As such, I am convinced pecans are undoubtedly one of the most underutilized wild bird foods. Years ago, I accidentally discovered that some wild birds are extremely fond of pecans. At that time, a large pecan stood alongside a highway near downtown Forsyth. Each fall this tree dropped nuts onto the nearby highway. Most of these pecans were crushed by passing cars. One winter day as I was driving home, I spotted pine siskins risking their lives trying to eat bits and pieces of pecans strewn across the road. The least desirable manner to offer pecans is to scatter whole nuts on the ground or in a platform feeder. It has been my experience this attracts gray squirrels and large, voracious birds such as crows. If you crack the nuts open before you put them out, small birds will pick out pieces of the meats; however, squirrels and crows will still end up carrying off most of the nuts. Most folks prefer to either break up the nutmeats into small pieces or buy nutmeats or pecan pieces or chips. Keep in mind that small birds prefer chips. Chips and pieces can also be bought from retailers specializing in birding supplies, in grocery stores or at pecan shelling plants. Suet cakes laced with pieces of pecan meats are also available. As you probably already know, pecans will get rancid. This is especially a problem in warm weather. It is always a good idea to store pecan nutmeats in a freezer until you are ready to use them. The birds most likely to dine on pecans are woodpeckers (red-bellied, downy, red-headed), Carolina chickadees, blue jays, nuthatches (brown-headed, white-breasted), cardinals, American goldfinches, sparrows (chipping, song, white-throated), warblers (pine, yellow-rumped), eastern towhees, northern mockingbirds, eastern bluebirds and Carolina wrens. We now know that different birds have a broad range of food preferences. As such, there is no perfect food that will serve the needs of all species. With that in mind, if you are one of those wildlife enthusiasts who offers birds a smorgasbord of foods to try and attract a variety of feathered clientele, consider adding pecans to the menu. If you do, you may discover that pecans will help you attract a new bird species or two. If that happens, you will join the ranks of those of us that believe the pecan has been overlooked far too long.